If you’ve been doing any sort of research on leaf blowers, you’ve probably come across some with 2-cycle engines and some with 4-cycle engines, also called 2-stroke and 4 stroke engines. The differences are fairly simple, and we will highlight them here so that you can decide which one is best for you. Any 2-cycle engine will require a gas/oil mixture to run. They are also more powerful than 4-cycle engines. Most leaf blowers that you see will have a 2-stroke engine because they are easy to design and cheap to build. Since there are fewer moving parts in a 2-stroke engine, they can afford to be cheaper. 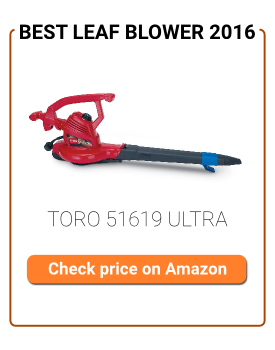 And most people have 2-cycle leaf blowers because of the price difference. 2-cycle leaf blowers are also generally lighter. Being powerful and light are the two main factors that make a 2-stroke leaf blower a popular choice among homeowners. However, the gas/oil mixture is what makes the 2-cycle leaf blowers very loud and also pollutes the air. It is convenient for users to put a gas/oil mixture in one fuel tank, but that is also what makes it less appealing when it comes to the noise and pollution. 4-cycle leaf blowers are less common in terms of units sold, but people are more familiar with how they work. They can be compared to a car engine, because you have to put gas in the fuel tank and put oil in the crankcase. People who have 4-cycle blowers like them because they are more fuel efficient, and you don’t have to worry about getting your gas/oil mixture just right. The oil doesn’t burn off like it does in a 2-cycle engine, so the engine runs more efficiently as a whole. A downfall of the 4-stroke engine is that it is heavier, because there are more parts that make it go. The only way for it to have as much power as a 2-stroke engine would be to have a larger engine, which would make it even heavier. There are more moving parts in a 4-cycle blower, so it is almost always going to be more expensive than a 2-cycle blower. Like a lot of things, the best leaf blower is the one that fits your specific needs. If you want a more powerful leaf blower and aren’t worried about anything else, then go with the 2-stroke. But if you want a blower that runs more efficiently and are willing to put up with a heavier blower, then buy a 4-stroke. As mentioned, the 2-cycle leaf blowers are the most popular because they are cheaper and lighter. Most people use blowers just for residential use, so convenience is one of the main factors when it comes to buying a new leaf blower. Before you make your decision, be sure to weigh the pros and cons so that you can make the most informed purchase. What Brand of Leaf Blower Should You Buy?